In Virginia’s Second Congressional District conservative Mary Jones is taking on RINO and leading amnesty for illegal aliens advocate incumbent Congressman Scott Taylor. Mrs. Jones is a solid constitutional conservative with a record of fighting taxes and regulations as a member of the James City County Board. Taylor’s one credential is his military service – he’s a former Navy SEAL, and in military-heavy VA-2 that counts for a lot. More specifically, Taylor has a record of voting with Democrats on a host of hot-button conservative issues, especially amnesty for illegal aliens. Some readers of this article will also remember Congressman Taylor as the person who called our friends at NumbersUSA and, in a profanity-laced tirade, threatened to “blow up” their office when they outed him for his efforts to promote amnesty for illegal aliens. Taylor is one of the leading RINOs who have joined with Democrats to try to force a vote on amnesty for illegal aliens through a “discharge petition” that would amnesty millions of illegal aliens, without ending chain migration, the visa lottery or building the wall on our southern border. Lieutenant Commander Maulbeck is right about Taylor being an arrogant self-promoter. Taylor never seems to miss a chance to go on TV to push for amnesty for illegal aliens and to trash conservatives and President Trump. It is past time to send him home. 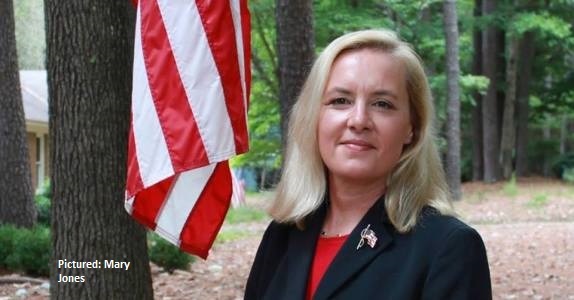 We urge our friends and fellow conservatives in Virginia’s Second Congressional District to vote Mary Jones in the June 12 Republican Primary.